I love how many free listings eBay passes out. Tonight ends the latest promotion - everyone gets 5000 free listings. Huzzah! Of course I procrastinated HARD on this listing pile because it was all stuff I kept pushing aside because I didn't want to list or ship. We're talking about porcelain, unboxxed glass, fragile cups. Basically everything I need to stop buying because its too much of a hassle to ship was left. I have some clothes to list too. I really hate listing clothing even though shipping is easy and markup is normally decent. I just hate measuring and its always a pain to photograph. Is it garage sale season yet? Can I take all my eBay duds and set them up on the driveway now? Oh my gosh! 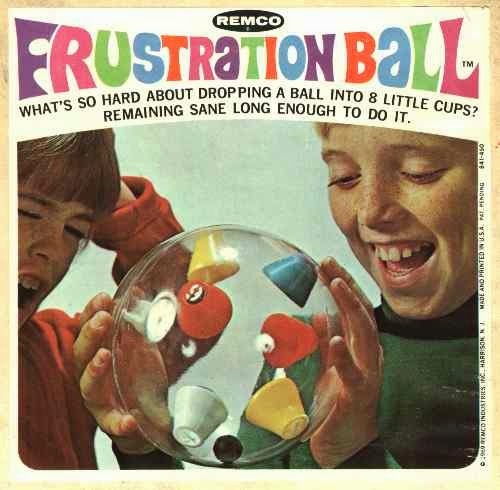 My sister and I have been searching everywhere for one of these frustration balls! We didn't know that was what they were called. We had one as kids and loved it. My dad especially loved it!